Giving Tuesday, observed on the Tuesday following Thanksgiving (11.28.2017), takes the focus off of the commercialism of Black Friday and Cyber Monday and instead celebrates giving back. 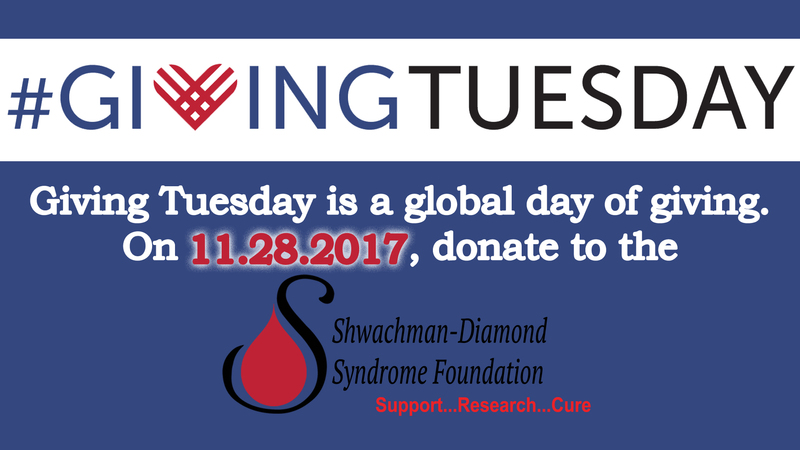 Why not give back to the Shwachman Diamond Syndrome Foundation to help fund research for a cure? On #GivingTuesday Facebook and the Bill & Melinda Gates Foundation are matching up to $2 million of funds raised on Facebook for U.S. nonprofits and Facebook is also waiving all fees for donations made to nonprofits on Facebook. Make your facebook donation on 11.28.2017.